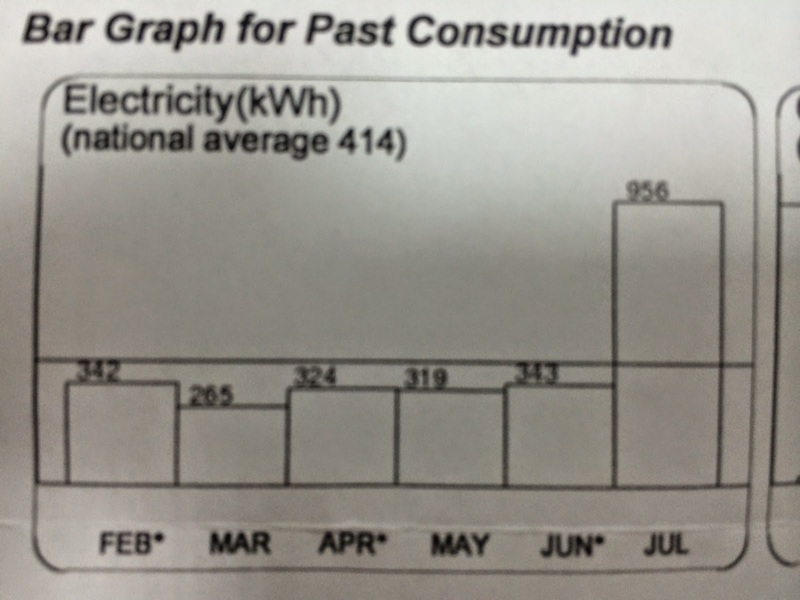 Yesterday, I was shocked to see my electricity bill was more than three times of my usual monthly consumption. In fact, it is at the stage of inconceivable! How I wish my portfolio can be magically done the same too. The reason why I used the words "inconceivable" and "magically" is because there is no major changes to the pattern of the way we use our appliances/equipment at home and hence my jaw dropped to the floor when the consumption surge from the usual $80 plus to $240 plus. (note : you can see the "nice" bar chart of the past consumption on the left). 1. The air-conditioning consumed more electricity under warmer weather (I can accept this but the increase cannot be so humongous). Of course, I don't buy the ideas at all and requested for the meter to be re-assessed (an appointment has been scheduled at the end of the month). Also, it seems that SP Services doesn't have the record/log of our daily consumption and hence there is no way to verify the past consumption. I am not sure this is happening to me alone or there was some hiccups in the SP Service system/meter readings, you folks better counter check your utility bills this month ;-) Oh, by the way, if you have similar experience, do share with me how did you handle the situation. Come and think of it, if my stocks triple its share price within a short period of time, we will also question the cause(s). Wouldn't me? I had shocks like this, but not to the tune of tripling. It's more like an increase of 30 to 40 bucks, which is kind of acceptable for the usual reasons they give. You might want to put in your meter reading every month from now on. It's quite simple, and I believe they have an app on that too. Hi Butterfly, ya lor, if only 30 to 40 bucks, I still can accept it..
Don't quite understand when you said "put in your meter reading every month from now on.." any idea how to do it? Here's the app for iphone. There's one for android too, just search for it. If the app is too buggy, just go online and log into your SP account to key in. This would eliminate the estimation part done by SP every other month when they are not taking down the readings. Does it means that with this app, we are doing the job for them on monthly basis? lol But will still check it out.. Are you using the app now? If yes, so far they will just use your reading? I've no reasons to use the app in the past cos my bills are all quite reasonable. I've just downloaded the app and will be using it from now on to try it out (after reading your horror story of overcharging by 3x). They only accept meter readings on the months they are not checking your meter. They check the meter every 2 months. I think they will still come down personally to check your meter readings to verify, so nothing's going to change except for the months they are not reading your meter. oic... thanks for the clarification. Will keep you updated once I've unravelled the myths of my case! That's one of the possible reason which I hope it is true... ya, already made an appointment with SP Services to counter check the meter at the end of this month.